TaLynn Kel is a published essayist, educator, and cosplayer. She uses her enjoyment of cosplay to examine social and structural issues of American culture through the lens of pop-culture fandom. 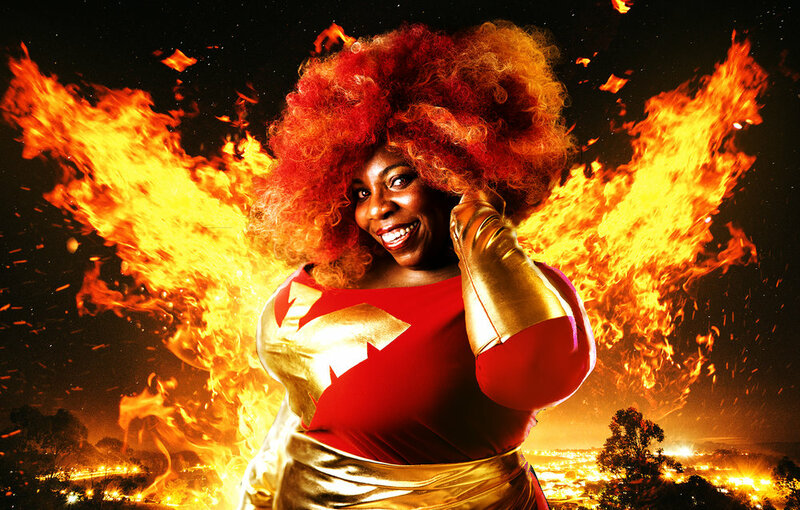 Having been an active participant in the cosplay community for thirteen years, TaLynn has a unique perspective, especially as a fat, Black, woman and has been featured on NBC for her approach to the art. She has also been interviewed by outlets such as The Mary Sue, Rolling Out Magazine, Brit & Co, and Ravishly. TaLynn is an avid essayist. Many of her essays have been published by numerous websites, including Huffington Post, The Establishment, Fabulize Magazine, The Curvy Fashionista, Black Sci-Fi.com, AlterNet, Everyday Feminism, and Black Girl Nerds. TaLynn is an active and adept public speaker. She creates new content that she presents at various cosplay and fan conventions throughout the year, talking about the intersections of race, gender, size, ableism, and sexuality. She has presented at conventions like DragonCon, MomoCon, and the Atlanta Science Fiction and Fantasy Expo as well as serving on panels at the previously mentioned convention plus Mid City Micro-Con, BlerDCon, and Blacktasticon (formerly known as SOBSFCon). TaLynn curates new content constantly throughout the year for her interview show, Time Out with TaLynn Kel. She attends multiple conventions to interview Black creators. With 40+ interviews under her belt, TaLynn has created a catalogue of Black-created content with commentary on the work directly from the creators. In addition to the above, TaLynn cohosts the New Wakanda podcast with Sorghum & Spear creator Dedren Sneed and Route 3 creator Robert Jeffrey II. The podcast talks about the lift of being a Black creator, real time with real information about the hustle. “Normal is a lie. It always has been. It’s a curated reality that is often the depiction of aspirational whiteness…a reality that actively excludes races, bodies, sexualities, and ideologies that do not conform with the image whiteness seeks to have of itself. To be a visible, fat, Black woman in this world, not only are you constantly enraged, but you are constantly erased from the story of your life. Your humanity is questioned. Your morality is suspect. Your survival is a testament to your strength, and your refusal to be silent and invisible is an act of defiance. My life is a constant act of defiance as I dare to embrace my humanity and share it out loud and only mildly censored…sometimes. Link to additional media and press coverage of TaLynn Kel. Additional media and press coverage of TaLynn Kel. I have facilitated many safe-space conversations around the politics of race, gender, body image, activism, and cosplay in both online and in-person geek spaces. I am available to speak at conventions, conferences, and academic spaces. I am also available to host events, moderate panels, and interview content creators. Do not hesitate to contact me regarding rates and availability. I develop my content with the intention of audience participation. I firmly believe that learning is collaborative and these sessions are opportunities for both me and those in the room to learn how to improve our understanding of the world and society in which we live.